If you’re interested in Visio as a sales-force automation tool, or just want to rip apart SmartShapes and VBA code to see how to build Visio-based solutions, then I urge you to have a look at this solution. 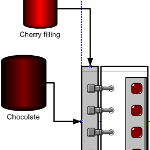 You’ll find it on MSDN here: Custom Visio Solution: Candy Equipment Manufacturing Example. The demo comes complete with a Visio Template, an MS-Access database of all the candy equipment (stop lauging! ), and a Word document that includes notes on the demo, as well as the Demo Script for walking you a test-scenario. Custom shape design: The candy manufacturing equipment shapes are custom-built for this demo. They illustrate how Visio shapes can have high-quality graphics, contain parametric behavior, link to databases, store data as custom properties, and invoke automation code. The ShapeSheet interface is a spreadsheet-like tool that comes with Visio technology. It defines behaviors and data properties that are part of every shape. As in a traditional spreadsheet, ShapeSheet cells can contain conditional formulas and references to other cells, which can be built up to give shapes their smart behavior. Parameterized shapes, ShapeSheet interface, smart graphics: The SmartShapes symbols react visually to data. When a shape is dropped, the user specifies the exact type of equipment the shape represents by choosing a manufacturing line and model number from the database. These properties serve as keys to other data about the equipment. For example, the size and appearance of the shape changes according to this data. The ShapeSheet interface is used to program this parametric behavior. ActiveX automation code Visual Basic: Visio products include the Visual Basic for Applications (“VBA”) development environment. This enables developers to place automation code behind a drawing. In this demo, VBA code is used to create the bill of materials, to make sure the ODBC database is registered when the drawing is opened, and to place shape data in the text of the Auto-label callout shape when it is dropped over equipment. You can also use other automation-capable development environments such as Visual Basic and Microsoft Visual C++ to control Visio operations. Microsoft Office integration: The embedded Excel object shows how well Visio works with standard software components. 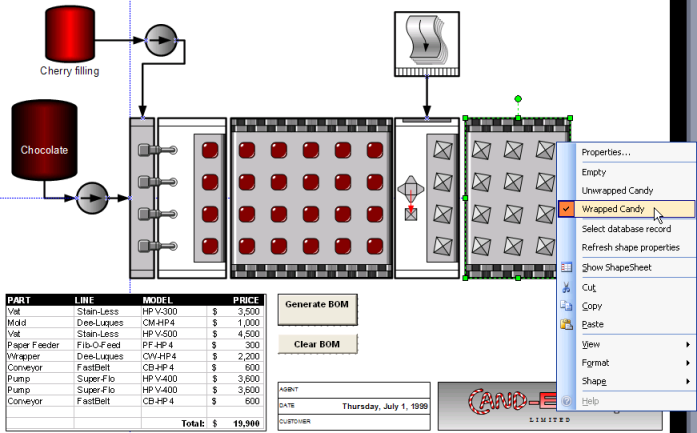 The embedded spreadsheet receives information from the drawing to create a bill of materials. This illustrates how solutions can be built from standard components. Rather than try to build a grid out of Visio shapes, why not use the best tool for the job? Hence the embedded Excel spreadsheet. ActiveX controls: The ActiveX command buttons perform tasks such as creating the bill of materials and clearing the embedded spreadsheet object. These buttons invoke code stored in the document’s VBA project. Custom patterns: The Conveyor shape can be configured to show wrapped and unwrapped candy. This shape can be stretched to any length and still have an appropriate appearance. Visio custom pattern masters are used to represent the candy, as well as the linkages on the edges of the Conveyor shape. SmartShapes symbols that call code: The Auto-label callout shape uses the CALLTHIS ShapeSheet function to access a VBA procedure whenever its endpoint moves. This code determines which shape the callout is pointing to and reports the shape’s custom-property data in the callout’s text. The equipment shapes use the RUNADDON ShapeSheet function to access the Database Wizard’s functions when the user drops the shapes or chooses certain right-click menu items. Layers: If a Conveyor shape is stretched past a certain width, a special bitmap appears. What happens behind the scenes is this: When the Conveyor shape is stretched beyond a certain point, a SETF formula toggles a value in the page’s ShapeSheet. A ShapeSheet cell that governs the visibility of the bitmap layer has a formula that refers to the toggle value, and the bitmap magically appears! With Visio layers, you can classify shapes on a page, hide them, lock them, and so forth. Because these layers are governed by ShapeSheet cells, conditional behavior can be placed upon layer properties themselves. Automated setup: This demo involves multiple files and some system settings (ODBC data source creation), but the VBA code takes care of it all. Just copy the directory and you’re ready to go! Nothing show-stopping here, you’ll just end up with another data-source on your machine that points to the local Access database. But I think it’s the right thing to do to inform users as to what is happening to their systems. Since the demo includes a barely-started system, I thought I’d show you what a completed candy manufacturing line looks like (stop laughing again!) You can see how more equipment has been added to the line. The wrapper, the paper feeder, the conveyor belts, etc. Note also that the Excel BOM has been filled out, and that the user is changing the right-most conveyor belt to depict wrapped candy. This feature utilized custom patterns to generate the repeated graphical elements! I’m not the brightest bulb in the pack and you seem to know Visio so I hope you don’t mind me posing a question to you. I am an automation engineer programming PLC’s. I can place live data from a PLC on to an excel speadsheet. What I want to do is cause shapes to change color based on the values in my excel spreadsheet. Can you point me in the right direction? I have posted the same question on several forums, but I haven’t had any responses. Right, just the excuse that I needed. I also need to ask a related question that has been driving me mad for ages. Well sort of related. I am still stuck with 2003, so please bear that in mind. My problem is in mapping dependencies. I figure that if you have a 1d arrow connecting two 2d shapes, there must be some way of exporting to access or excel such that you can say block A precedes block B. This helps in automatically identifying the blocks that are dependant on one another. On the other hand the database export function shows which ShapeID’s the 1d endpoint are glued to. This is in a string, but with a bit of code this can be separated out to produce the dependency. This helps is automatically showing the dependency between the two blocks. With both pieces of information, the complete picture can be constructed. 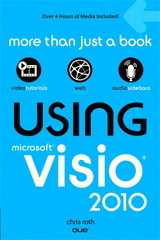 You mentioned in your intro that demo was originally created for Visio before 2003. I am running 2002 and the some of the shape features don’t work with this file. Do you happen to have an older version? Well, I thought that I had uploaded a 2002-compatible version, but evidently it is 2003/2007. I’ve just added a link for a 2002 version, also way up at the top of the article. Hopefully this will get you going! Its the most popular post at the moment, and I think i should explain all your questions. “it” should explain all you questions. Link to MSDN location is dead. Thanks Steve. I think it’s been dead for awhile, that’s why I’ve provided the .zip files here in this article. Is it possible to generate C# codes from Visio flowchart? For example, if i draw a flowchart of a system including decision boxes, looping, sequence control etc.. Then can Visio churn out the corresponding C# codes? ie. like a program generator. It’s kind of the reverse of what you need to do, but it shows you the power of Visio automation. The Visio SDK contains examples for tracing connections in Visio diagrams, ie: which line is connected to which shape. With this info, you could build the tool you are envisioning! The zip file only contains the Visio file. When I insert a shape it asks for the access db. Can you please repost the example with all of the files? Your website has been great in helping me understand how to make a configurator for my company. Check the links again, I’ve uploaded new .zip files that include the database. The Object property apparently no longer contains Worksheets. Any clues how to fix this? Just shooting from the hip, I am wondering if there is a missing reference to Excel in the VBA project? Do you still have the Word document that should be included with the demo (notes on the demo, as well as the Demo Script for walking you a test-scenario)? I just downloaded both files but don’t see any reference to it. I’ve updated the downloads to include the Word documents. Thanks for pointing this out! Do you have an updated version of this using Visio 2013/Access 2013 ? Looks like a very cool concept ! Would like to learn more details on it especially if it can work with the newer office versions.